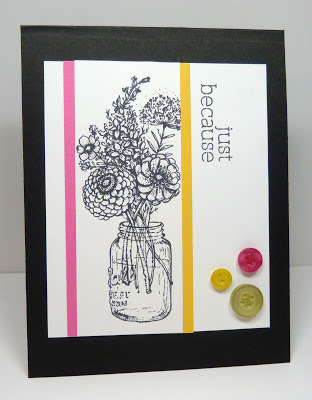 I have some blogging friends I met through WMS that are on the DT for Serendipity stamps. I, personally, was not familiar with this stamp company but, there are some adorable images!! Anywho, they started a blog challenge and for this past challenge a free digi image was provided so, I thought I would play along. Challenge #4 Have a Care. 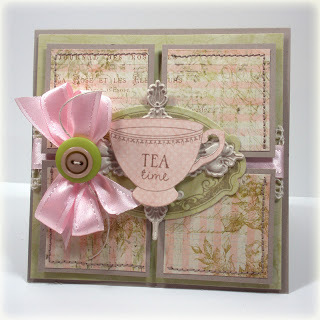 Use one of the Have a Care images Serendipity Stamps offers free with your purchase. Designs are to highlight a cause (examples including but not limited to Breast Cancer Awareness, Adoption, Recycle, Pet Adoption, etc). 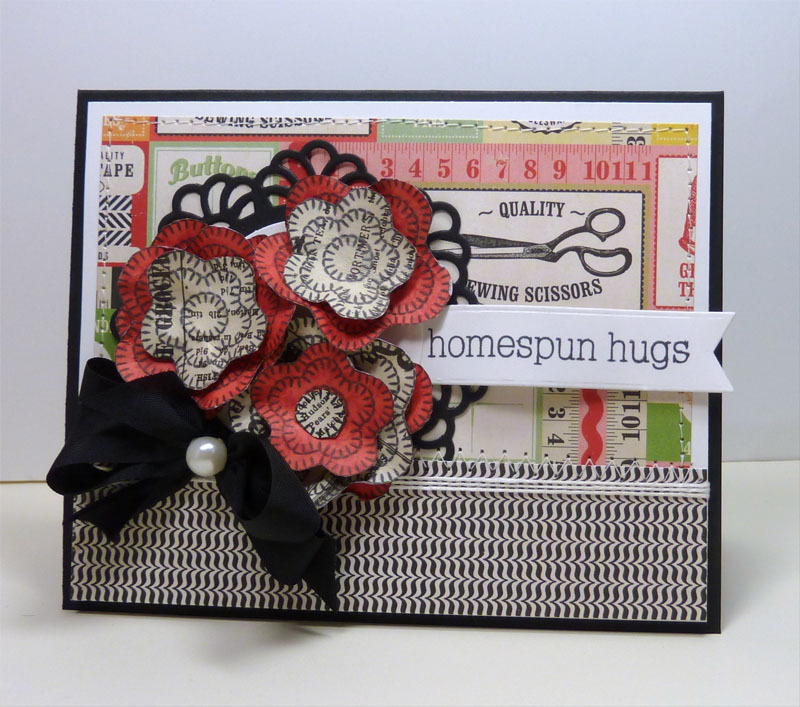 Please note that a Serendipity Stamps image must be displayed somewhere on your design. Don't have a stamp? You can grab our free digital image - just cut and paste into Word. Isn't that the fanciest "Recycle/Reuse" image!! 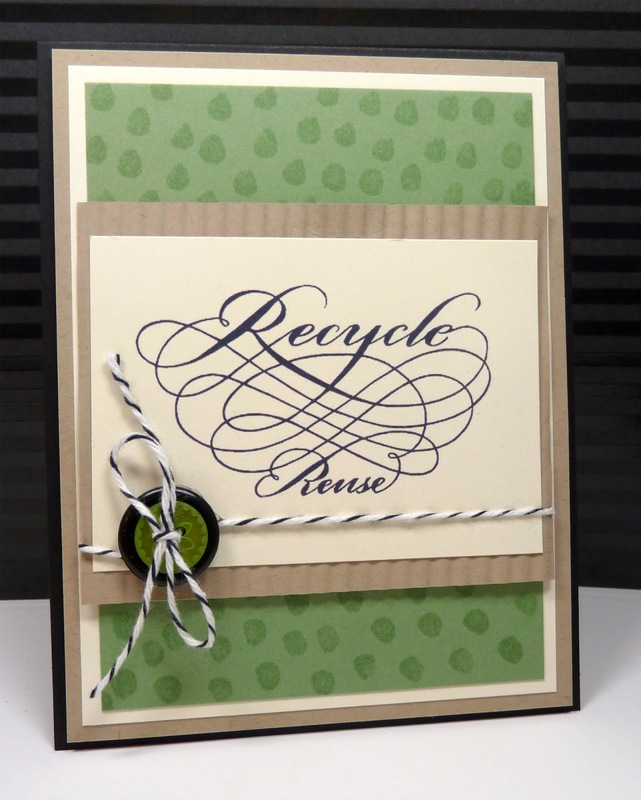 And being in the "spirit" of the challenge I add some green cardstock (Go Green) that was stamped in versamark using the rubber end of a pencil, added buttons- those extras you get with sweaters, pants, jackets (Reuse) and recycled some cardboard from packaging. Here's the link to the challenge!! Hope you're having a Happy Hump Day!! Me, I've been a bit busy at work but, hoping to catch up on some blogging and creating!! 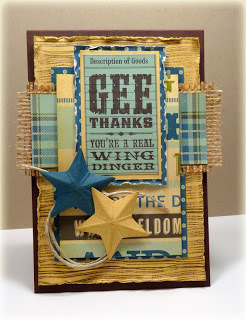 Okie Dokie... continuing the CAS style and wishing I had that "gene", LOL!! No, really it is definitely working my brain cells- which is good-keeping the Alzheimers at bay! Honestly, I've had my girls accuse me of not remembering things and honestly, don't think it Alzheimer's, I think the prattling went on tooo long and I tuned out!! Girls can prattle, seriously prattle!! Here's my card for the CASE study challenge this week using some "new to me" treasures from WPlus9. 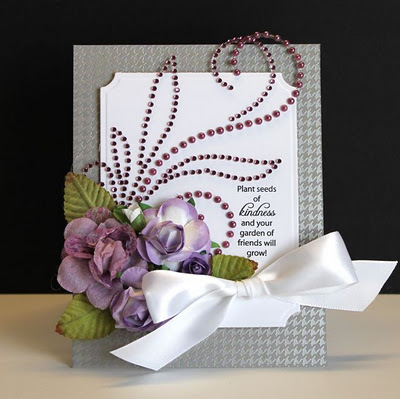 This month at the CASE study challenge- Amber from Damask Love is the MUSE. 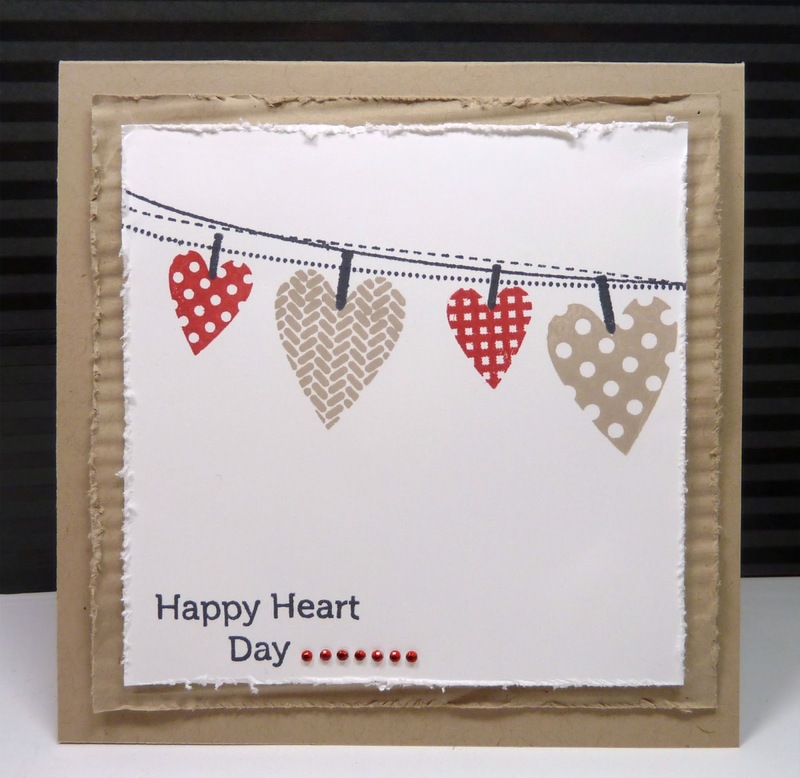 Used WPlus9's Heartfelt Mix for the hearts and clothesline... sentiment from Love Birds. Did some distressing and added a little bling along with the crimped paper. 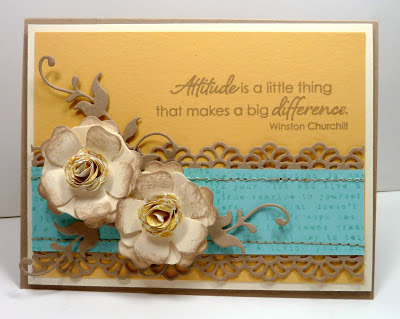 This is one of my fav color combos!! This week's Color Throwdown colors are certainly celery, garden green, wisteria wonder, and perfect plum. 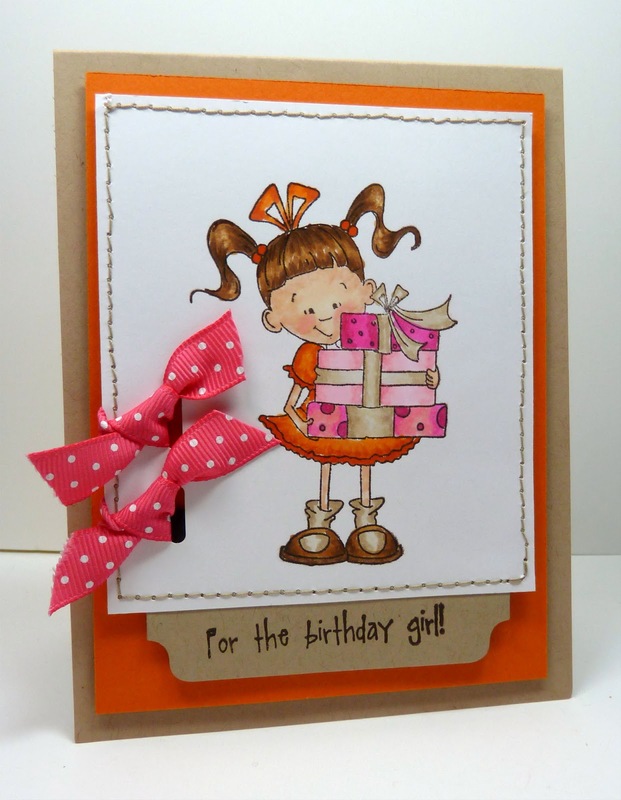 The week 5 Verve sketch is CAS- created by Charmaine. I'm trying... still trying the CAS style. Lots of white space on this one!! I have been creating so many Valentine/Love cards and I'm wishing for spring!! The flowers were die cut with Verve's Scalloped Flowers die and stamped with a bloom from Verve's Brighter Days- sentiment from the same set. Rounded the bottom corners (not sure about that), added a titch of scoring and a little bling. This is my card for the monthly sketch challenge at The Crafts Meow. It's a lovely sketch created by Nina B. 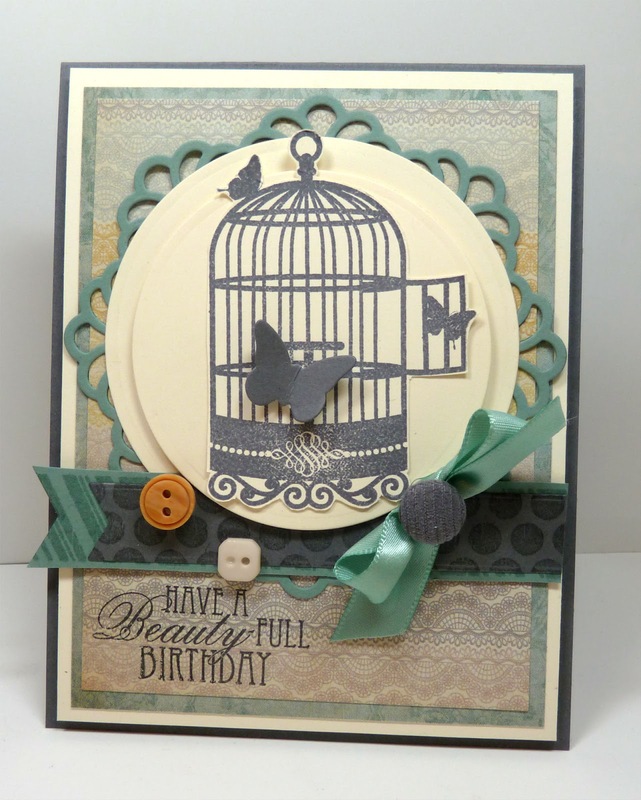 The sentiment and birdcage are from Fly Free by Nina B and the banners were stamped with images from Holiday Foundations by Karen Baker. Papers are MME Ms. Caroline Fiddlesticks. The butterfly and doily are die-namics from MFT. Hope you having a wonderful WE- we had a little ice yesterday but, the sun is out today and everything has melted. Thanks for stopping by!! Love hearing from you and appreciate all the kind words!! I'm posting a couple projects today!! 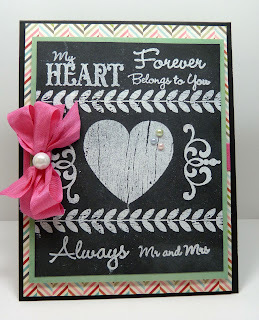 The Head Moustress at WMS has a challenge to use the chalkboard technique and I made a card for my hubby... it's a little "girly" but, I know that boy can handle it-- after all we raised two girls!! Yes, the man is getting pink ribbon and pearls!! Now, I may be showing my age... do you remember when the first men's pink/lavender shirts and ties came out? We bought Bill a sweater and challenged him, yes he wore it. HA...that's how it works at my house! It's a wonder he has survived three girls!! Images and sentiments are from WMS My Heart and the flourish is a "ditty" from WMS Vintage Labels 10. 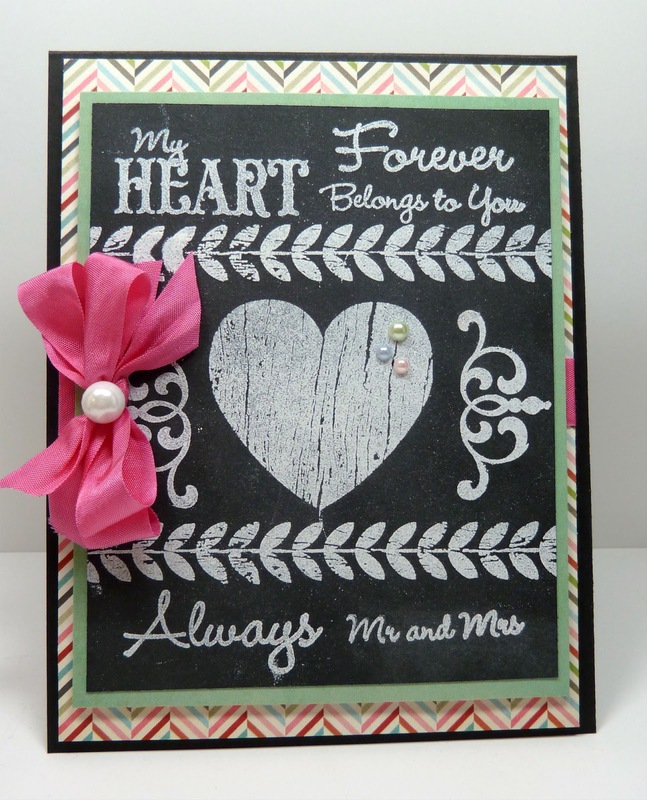 Papers are Basic Grey True Love, ribbon is from The Ribbon Carousel and pearls are a combination of SU and Pizzazaplenty!! It's week two with the CASE study challenge. Amber from Damask Love is the MUSE and it's another week for this girl working on a CAS style....jiminy Christmas (should look up where that saying comes from) I have to work hard at this!! It's the white space thing and I'm a messy stamper so, it doesn't bode well for a clean card (get my drift)- I had to redo this several times to get a panel with clean white space and then, I had to sit on my hands to keep from adding just a little something, LOL!! I went with a floral image, basically CAS- but, not one layer, and the colors. I did add those three little buttons at the last minute--that's my little sumthin' sumthin' and it made me happy!! The image is from a set by Flourishes- Garden Picks and one of these days I will use it to do some coloring but, the image is so detailed I think it looks fabulous in black and white too!! Thanks for stopping by!! Love hearing from you! Appreciate all the kind words!! Since the Holidays are over and I'm feeling better from the "bug" I caught-- I was in the mood to do a little coloring this weekend!! Still practicing those skills-- lots more work to do but, this didn't turn out too bad! 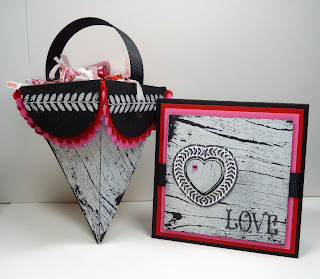 Love the Lulu's from Kraftin' Kimmie stamps and the CTD225 colors were perfect for what I had in mind!! Card is pretty straightforward. 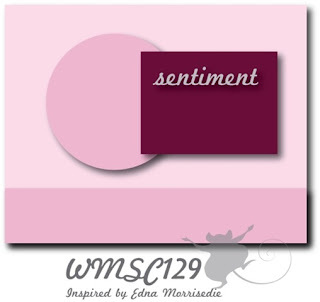 Sentiment was stamped on a MFT tab die-namic. My orange is a bit brighter than the graphic but, it is Pumpkin Pie. I have also shied away from using the same color but, lighter/darker versions.... not sure why... just, not a "go to" for me. Will have to do this more often! 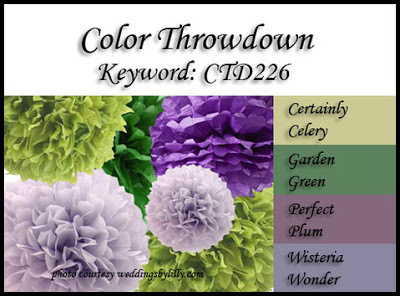 Here's the link to the Color Throwdown challenge with all the deets! Good Sunday morning!! So far, it is a really good Sunday morning for me!! I think I am finally on the mend from a "bug", honestly I don't think I have coughed that much in years, and exhausted... phew... haven't slept that much in years!! My youngest is not feeling well and she told me that she appreciated me sharing, LOL!! 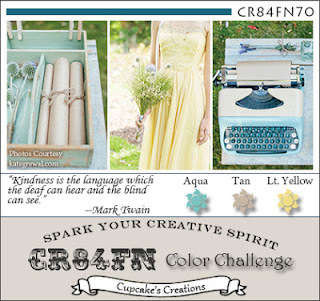 It's time for week two of the CR84FN70 color challenge and we are still playing with Aqua-Tan- and Lt. Yellow!! Gorgeous colors and gorgeous picture story!! It's interesting... when I photoshop on my new computer my cards do not look as dark as they are...guess there's a learning curve! Had some fun playing with some new goodies from MFT!! Don't you LOVE those hybrid roses!! 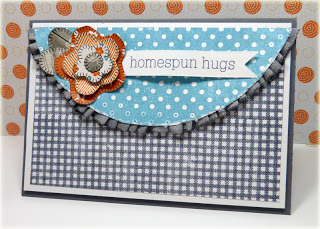 The aqua border was stamped with an image from Own Your Story- added some crochet doily borders and a little stitching. 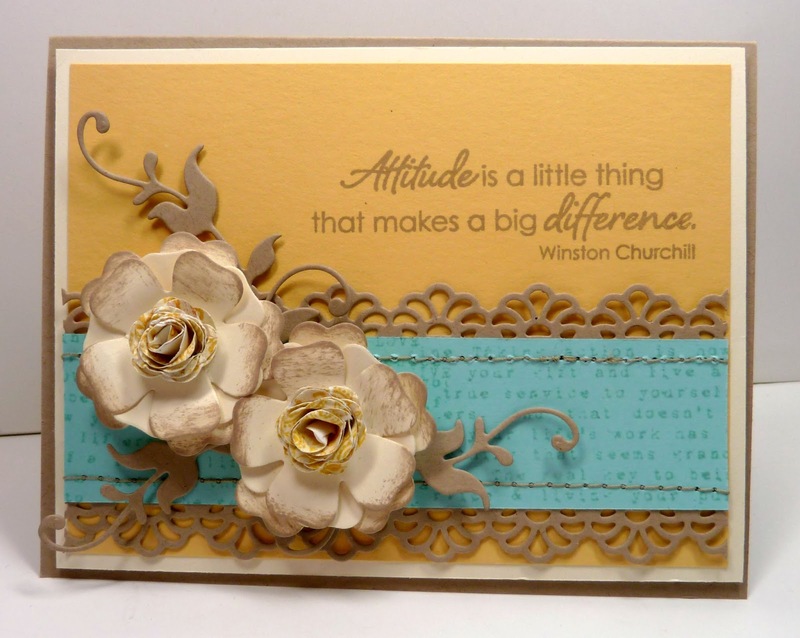 The petals on the roses are from cream CS cut three times- the outer layer and inner layer were distressed with crumbcake ink and the rose center was made with Authentique PP. 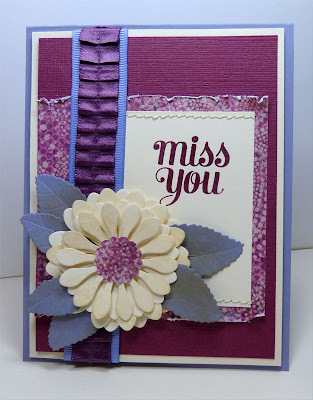 Added some MFT flourishes and a wonderful sentiment from Clearly Sentimental About New Beginnings. 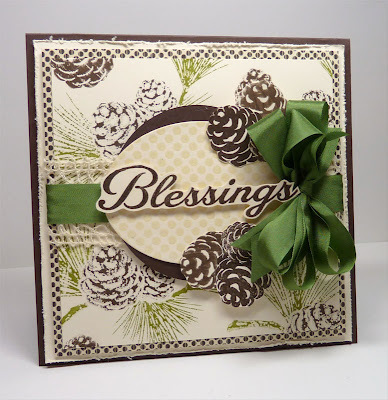 Here's the link to MFT--- have fun browsing/shopping!! Thanks for stopping by!! 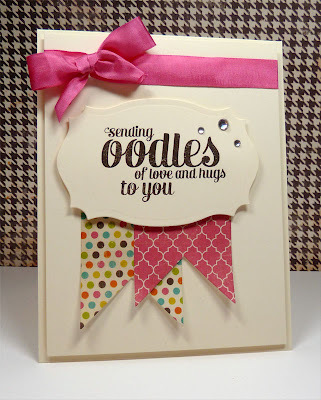 I am a bit behind in blogging but, I will be around to see your fabulous creations!! ETA: This is the last CR84FN color challenge. Mona has decided to close the challenge to focus on other opportunities. Although, I am sad to see it close (not just as the DT but, as a long time player), I understand and will certainly still be "stalking" her blog- that girl knows how to play with paper and paint and inks....Many thanks for the years of time and effort (Mona and Scott-who creates the graphics)--it was an honor to work with you!! Last but, not least Thanks to all my fellow DT members for all the fun, kindness, and support--see you in blogland!! As I was perusing the blogosphere, I noticed that Pauline and Deb posted their Waltzingmouse Sketch Challenge favs and was thinking (having a little withdrawal from one of my fav challenges) that I needed to do that too- especially since I missed the official posting for the last sketch challenge (OOT-old computer- although Santa helped me out a titch in the new computer arena). Anywho- talked with Jeanne Jachna at A Kept Life and today is the day a few of us are posting our favs!! I am fashionably late, if I do say so myself!! Another wintery card- love the folk art tree and the flourish is a "ditty" --it's stamped center to the circle but, I should have stamped with the tree in place- off a little! Claire fills up all of her sets! 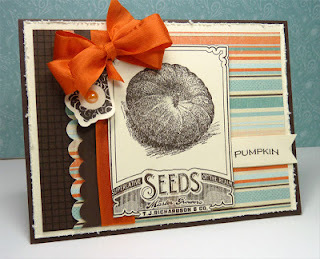 Love the Vintage Garden series Claire released! 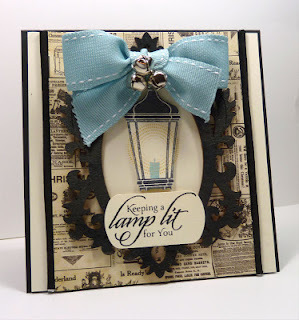 Fabulous lanterns/sentiments in this release! First card as a Guest Designer with the Mischief Makers.... yes, I felt pretty special that month!! Claire has the most fabulous Halloween stamps!! 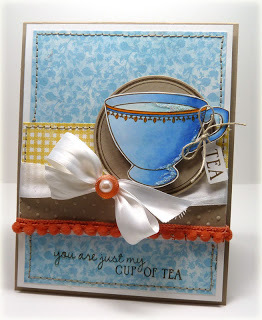 Ahh... the teacups/images/sentiments just make me smile!! 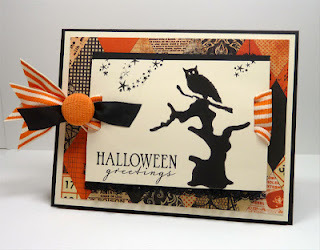 Halloween card combining different sets that was just different for me!! And this Santa silhouette just makes me smile!! Here's the list of others joining in the fun!! Stop by... there's a lot of gorgeousness (did I make that up or is that a word?) to be seen!! Thanks for stopping by!! Hope you're having a wonderful start to the new week-I'm fighting off a bug, I know, I know- it's going around!! Good Sunday morning- hope yours is a relaxing one!! Having a good WE- went to dinner with my daughter and SIL Friday nite- lazed around on Saturday. Laundry/cleaning/stamping is Sunday's schedule and then, back to work!! Dang... the weekends go so fast!! It's time for the CR84FN69 color challenge and we have some new colors for you. For the next week and a half, we're playing with Aqua-Tan- Lt. Yellow!! Aren't those colors fabulous!! I told myself that this is the year where I will use all the "treasures" in my stash!! Don't tell me you don't have things in your stash you haven't used yet. And... CHA is going on so "I know" there will be some new things I want!! 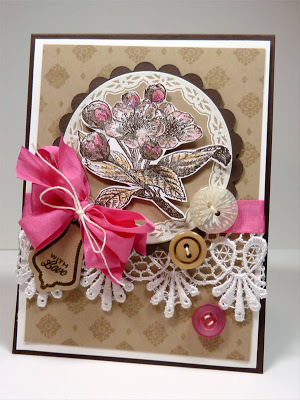 This card uses some patterned paper and MFT's fringe flower that have been sitting in my "coffers" for a while!! 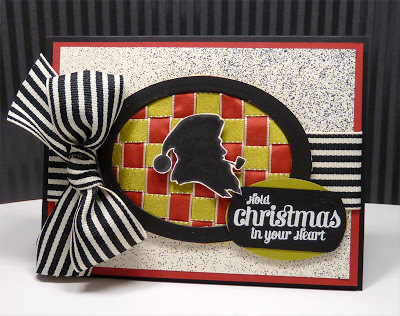 I stamped the harlequin image from WMS Heirloom patterns color on color for the background. Added a couple doily dies from MFT with a sentiment from WMS Compact Sentiments. 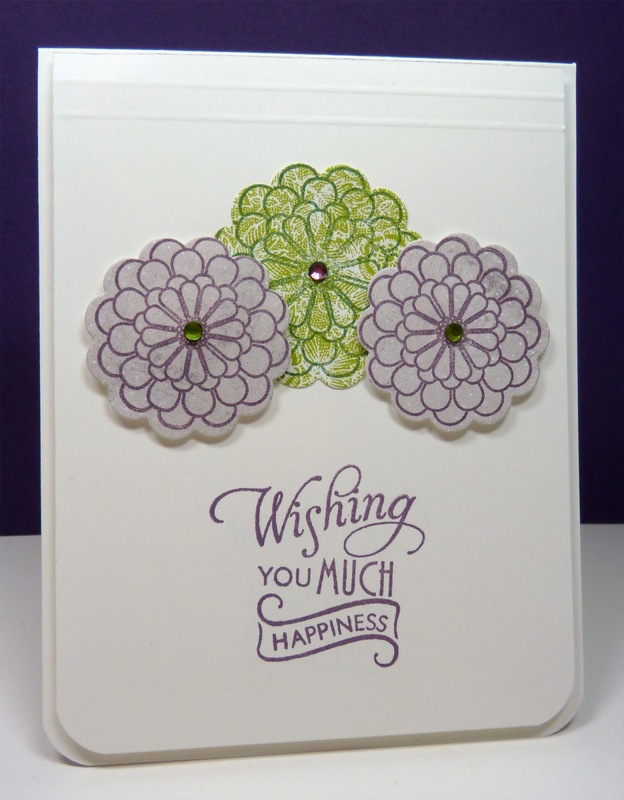 The flower is MFT's Fringe flower with a SU corduroy button/pearl combo. Seam binding is from the Ribbon Carousel. Loved all the creations for the last challenge and Congrats to the winners!! Can't wait to see what you make with the new colors!! 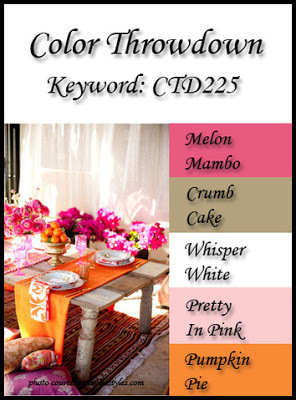 Check out the CR84FN69 color challenge blog for all the details and to see what the DT created!! 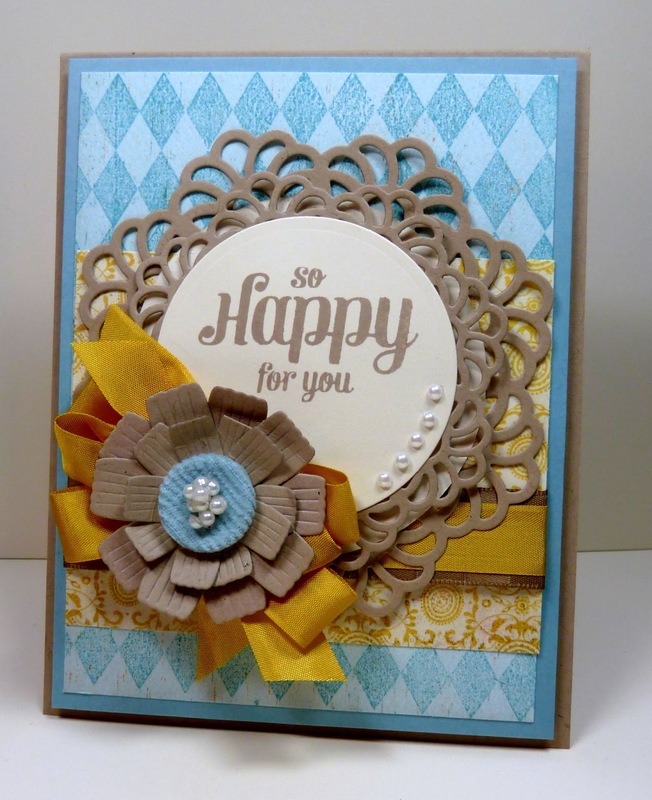 As well, we have the pleasure of having a Guest Designer this month, Lisa Snowdy of Adventures in Paperland-- go check out her fabulous creation!! Happy Saturday evening... hope your WE is happy and sunny!! Warm front came through and we are in the 60's-70- gorgeous day!! I had a chance to stamp a bit and created a card for the current CASE study challenge. There is a new MUSE this month and it is Amber from Damask Love. Here's the card we are casing. Perfectly balanced... perfectly CAS card. I tried my hand at CAS again... this is not a "comfortable" style for me but, it's always good to keep trying new things. 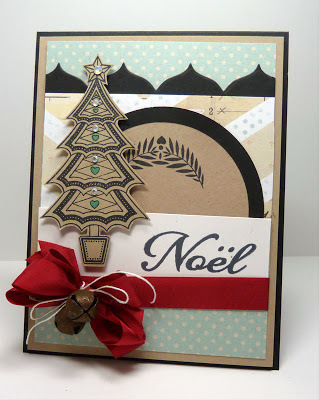 Used some new goodies that Santa brought me...WPlus9 Cupid's Arrow and matching die and the XOXO die. 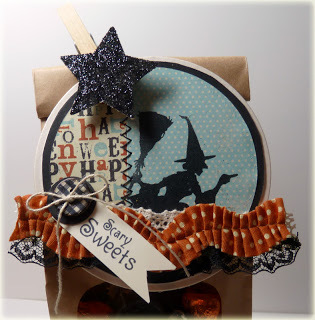 These are my first ever WPlus9 stamps and I had a lot of fun playing with them. 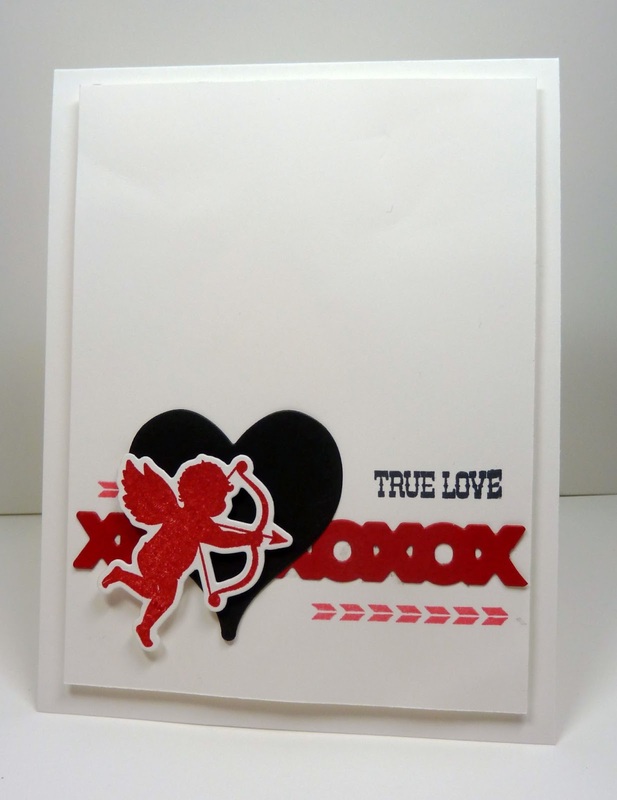 Aren't the stinkin' cute... who wouldn't fall in love with Cupid!?!? 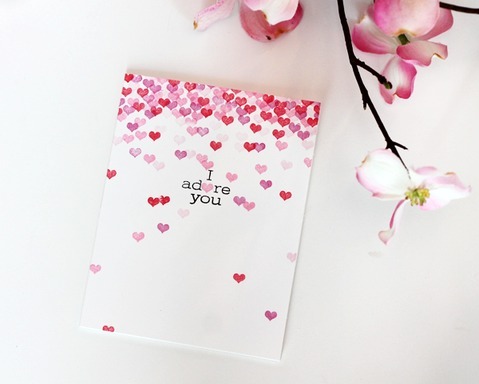 Obviously, I went with the colors, white background, and "love" theme. Well, that's it for me!! Happy Monday!! I'm here with a card for the current CASE study challenge!! I have to say... I'm loving the new computer but, it's different (took 96 minutes-yes, I looked at the time on the phone- to load PSE yesterday-Adobe PSE customer support pawned me off to Dell and I have to say the Dell person hung with me until things were loaded, it was not easy for them either- great customer service, still learning how to navigate through Windows 8-totally different) but, it "moves" and it's an All in One System!! The mouse is heavy- doesn't move as smoothly- thinking out loud-blog loud!! So, I got off track there. CAS, at least for me anywho! 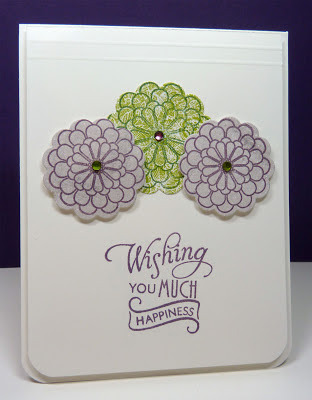 Stamped a flourish from WMS Flourishes & Scallops & Dots with SU crumbcake onto a crumbcake panel. DP behind this panel is from the Authentique Fresh collection embossed with CB swiss dots. The bird is from my stash- Recollections. 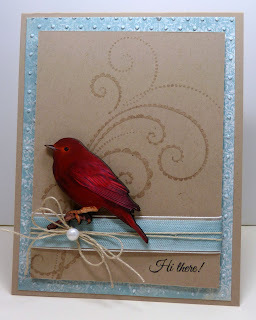 Love the pop of red with blue and kraft. I have this goal to use up some of the goodies that I have collected (paper, embellies etc). Added ribbon, twine, and a pearl to finish things! Cute sentiment is Verve's Wordy Birds. Thanks for stopping by!! Appreciate all the kind words!! I am so happy this is a new year, after hubby's two surgeries and the holidays it feels good to move on to a more normal life!! Good Sunday morning- hope yours is a relaxing one!! I'm hoping to get caught up at home after being gone over the holidays...cleaning, laundry... all those fun chores!! On to the business at hand. 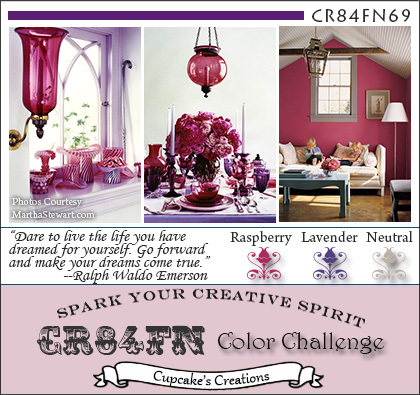 It's the second week for the CR84FN69 color challenge and we are still using the gorgeous colors of Raspberry, Lavender, and Neutral. Check out the CR84FN69 color challenge blog for all the details. Aren't those pics gorgeous and the quote is fabulous!! The layout is "generally" the Deconstructed Jen sketch from last week-- I did forget my borders at the bottom...oops!! 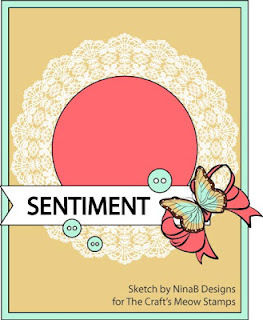 Sentiment is from Waltzingmouse Stamps Compact Sentiments and the flower/leaves are MFT's Plentiful Petals Royal Leaves die-namics. Thanks for stopping by!! Appreciate all the kind words!! I'm getting caught up this WE/week so I will finally get a chance to see what everyone has made using these colors... can't wait!! Are you out there? I hope so!! 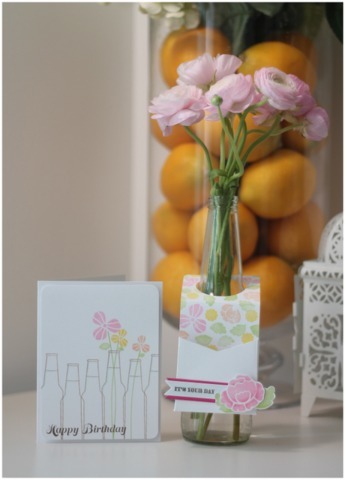 I am one happy girl... yep' home from the travels and grabbed a moment to make a card!! Well, happy and sad... sad that this is the last WMSC and sad that my old computer failed me last nite and I wasn't able to post it in time for the challenge....(was clicking on the insert image icon and there was no "choose files" or 'browse' button to pull pics from my computer... had to save to picasa web album and pull from there.... sheesh, sometimes blogger likes to stretch my brain cells, LOL!! THRILLED that I have a new computer (Xmas present) and it's working like a charm!! Just have to download/ set up some programs that I didn't have time to do before I left on my travels. I had a wonderful time visiting with family... when you laugh so hard... sides ache... wiping the tears... dang, I miss them already!! Even with all the serious business... (FIL's estate finally settled... that was a project!!! Hubs and I have a farm... one that I lived on when I was a newlywed....it's "gone to pot"... the house anyway.... but, Bill and I have plans to slowly fix things and get the house in a liveable state!) And, the weather in the Midwest... a little cold, a little snow, a little rainy (had to watch for freezing temps/weather to plan driving routes) but, we accomplished everything and my SIL can now head to Florida!! It's a bright one... lots of color.... yes, I am HAPPY!! I am a paper hoarder... there I said it!! Decided this year I had to use up some of the patterned papers I own before I can buy more.... hard to do... went looking today.... picked some out... placed in my card... but, I didn't check out!! 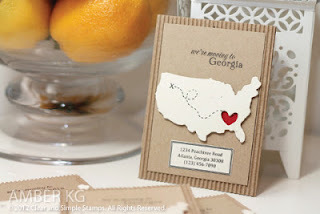 Found these papers in my stash before I left for the Midwest so, when I got back I decided to use them with Waltzingmouse Stamps Sewing Box Hugs... perfect fit!! Stamped and fussy cut several flowers from the set, sprayed with water, crinkled, and layered for a somewhat 3D effect. The background doily and sentiment flag are MFT die-namics. Added some twine, seam binding bow with pearly center. Thanks for stopping by!! Appreciate all the kind words!! Ha... I'm sitting here working from two computers since everything is not switched over and keep grabbing the wrong mouse...and, Windows 8 is different from previous versions.... I will persevere!! Honestly, I am gabbing up a storm!! Sorry! !